Perfect for any "little black dress" occasion. 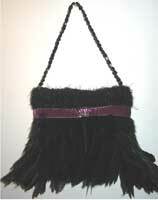 Black mini scarlett pochette with black feathers, black velvet trim with black button with 4 small rhinestones. Single black crystal strap and magnetic closure. Approximate dimensions 4.5 (w) 3 (d) 5 (h). 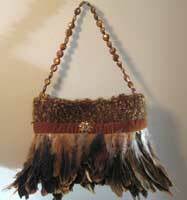 Stunning brown handbag with multi brown and beigecolored feathers. Beige velvet ribbon and beige rhinestone decoration. Freshwater pearl handle. Magnetic snap closure. Approximate dimensions 6(w) 4(d) 5.5 (h). Perfect for any occasion! 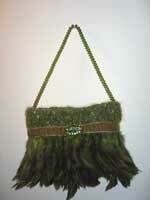 Brown bag with black accents and black feathers. Brown velvet trim and caramel brown rhinestone accent over subtle velvet bow. Double brown stone straps and magnetic closure. Approximate dimensions 6 (w) 4 (d) 5.5 (h). Fabulous Pink and Orange Bag. 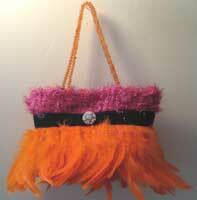 The top is hot pink, and the bottom is bright orange feathers. 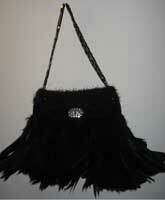 Black velvet trim with silver rhinestone. Double orange stone handles and magnetic closure. Approximate dimensions 6 (w) 4(d) 5.5 (h). Rhett would love this bag! Red bag with red feathers that have black highlights. Red velvet trim with red rhinestone accent. Double red crystal straps and a magnetic closure. Approximate dimensions 6 (w) 4 (d) 5.5 (h).